A traditional oval hole Mandolin, with a vintage sound and feel. Deep Rich sound, with a great low Register. The A-2Z is an upscale version of the A-2 with the same great sound. More complex body binding, slightly narrower neck (29mm) and a 'snakehead' headstock make this one of our most popular A style mandolins. The A-2Z has great volume and tone and is very evenly balanced. Great for traditional , orchestral or celtic styles. The same size body as the S-5 without the points and scroll with a very similar sound. The A-5 is a nice traditional f hole mandolin with great balance and volume. Great for bluegrass or orchestral music. The A-5 is a very elegant yet simple mandolin. The AJZ-5 is a complete departure from the traditional mandolin. Influenced by the D"Aquisto 'Solo" series guitars, this mandolin has one soundhole on the face, and side ports . With a unique cutaway headstock design, sleek neck and custom bridge , this mandolin is truly a Jazz one of a kind. The sound is truly unique as well, with very good definition between notes and a nice strong treble response for a great cutting Jazz sound. The AJZ-5 comes complete with an internal pickup system. A true European Style Bowlback Mandolin. Beautifully Flamed Maple, Spruce and dark Ebony make this a stunning looking and sounding Mandolin. With a deep, rich sound this is a great Classical Mandolin. The O-2 is one of the most popular Oval hole mandolins that Sawchyn produces. Styled closely after the F-2/F-4 mandolins of the 1920's the O-2 has a very elegant look and sound. With more refined construction methods than the originals, the O-2 has better sustain and clarity than most of the sought after vintage instruments. The O-2 has a nice clean oval hole sound with the stunning beauty of a scroll model mandolin. With the same specifications as the O-2 , but with a longer neck ( 15 Frets to Crosspiece) This is a true crossover mandolin between an F hole model and the Oval hole models. The Oval hole sound remains, but is slightly more ‘nasal’ than the shorter 12 fret model. With its classic looks and great playability , the O-2C is a Sawchyn favourite. Simplicity in design and appointments make the R-Series instruments a great bargain without sacrificing quality in materials or workmanship. All R-Series instruments follow the regular instruments in size, design and scale. By reducing the amount of decoration we have been able to create a lower priced instrument that still looks , plays and sounds incredible. 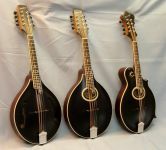 These are mandolins anyone would be proud to own. Superb workmanship and the finest materials make the Sawchyn S-5 one of the finest scroll model mandolins available. Careful graduation of the top and back result in a mandolin with great power, clarity and sustain, perfect for solo playing in any situation. Superb playability and tone.